On the site, voters will be prompted to enter their name, date of birth and address. If the voter’s record is found and the information is correct, nothing further needs to be done. If the voter’s record is not found, or the voter would like to update their information, they will be prompted to enter their driver’s license number or upload two pieces of ID. 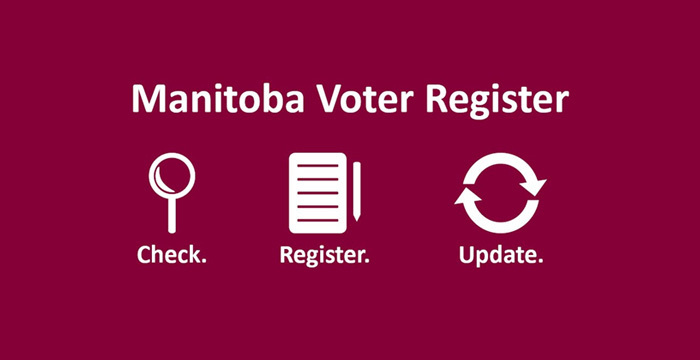 For a complete list of acceptable ID, visit electionsmanitoba.ca. Voters can access the online voter registration service at any time. Elections Manitoba encourage voters to use the service if they are moving or will be moving, if they are first-time voters, or if they just want to make sure they are registered. Keeping their information up-to-date helps ensure Manitobans receive accurate voting information and makes it easier for them to vote. New boundaries will be in effect for the upcoming election. Voters can find their new electoral division at electionsmanitoba.ca.